Guest post by Ben Hayes and Chris Jones. 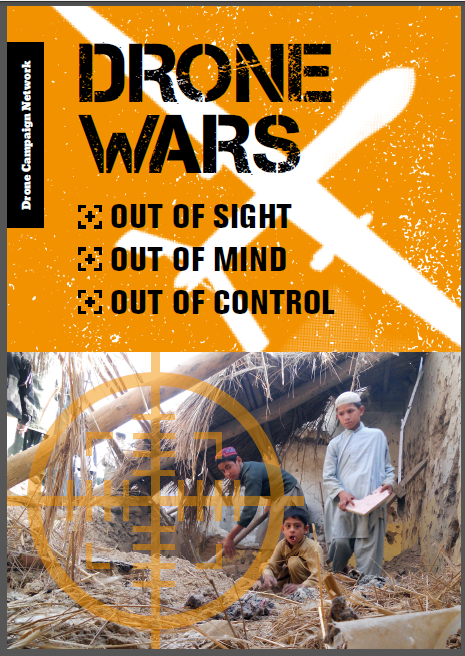 Today the Transnational Institute and Statewatch are jointly publishing a new report on the European Union and drones, entitled Eurodrones Inc. Our report examines the considerable economic and political support given to the drone industry by the European Union, which has now reached a level at which we can speak of an emerging EU drone policy based on two interlinked principles. First, an urgent need to develop and use drones in Europe for a wide and as yet unlimited range of purposes. Second, the various barriers – chiefly regulatory and technical – to the introduction and routine use of drones in EU airspace must be overcome. Eurodrones Inc. documents EU expenditure of some 500 million euros to develop and promote drones since they first appeared on the EU radar in the late 1990s, supplementing the substantial investment in drones by many member states. Yet, save for a few guarded European Commission communiques, very little information has been made available to the public about the scope and breadth of the EU’s drone activities and ambitions. Our report has been produced to inform the peoples of Europe and to encourage activism and debate around what is happening. Few new technologies have captured the media’s attention like drones. It’s easy to see why. On the one hand, they are among the most visible elements of a revolution in robotics and artificial intelligence that promises to transform not just our airspace but all of the vehicles and appliances. On the other, they epitomise peoples’ fears about a world in which we are not just served but policed by robots; robots which can kill. Of course, there are many situations in which drones may indisputably serve the public interest – search-and-rescue, environmental monitoring, dealing with hazardous materials etc. – but there are widespread concerns about both military and non-military uses, particularly surveillance We have witnessed research into and the development of drones capable not just of killing people at distance, but what are effectively flying CCTV cameras, micro-drones equipped with microphones, drones with equipment capable of intercepting mobile phone data, drones with autonomous targeting and tracking capabilities, ‘nanodrones’, ‘public order’ drones armed with ‘less-lethal’ weapons, and much more besides. Industry bodies may have recently moved into PR campaigns intending to show that drones can “benefit mankind as a whole”, but this is not the same thing as open discussion and debate on the issues raised by the introduction of drones into civil airspace. The European Commission has long subsidised research, development and international cooperation among drone manufacturers. The European Defence Agency is sponsoring pan-European research and development for both military and civilian drones. The European Space Agency is funding and undertaking research into the satellites and communications infrastructure used to fly drones. Frontex, the EU’s border agency, is keen to deploy surveillance drones along and beyond the EU’s borders to hunt for migrants and refugees. In 2012 the Commission announced that it would coordinate the introduction of drones into civilian airspace in Europe. A “roadmap” including a target date of 2028 for the full integration of drones into commercial airspace was published in June 2013. At face value, it appears that EU drone policy has emerged on an ad hoc basis as more and more promising uses for drones have been found. So taken with drones is the EU, that it argues that they are already a crucial “source of growth and jobs” in Europe. Because the development of drone capabilities has regulatory implications, the European Commission now feels compelled to act to ensure that European civil airspace is used in a responsible, considered and effective manner. This is the narrative that the EU is keen to promote. 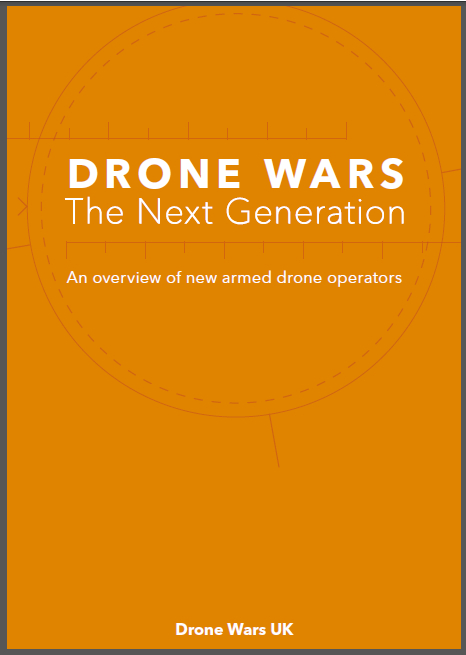 An alternative interpretation, suggested by our research, is that the agenda has primarily been set by the big drone manufacturers who saw a chance to supplement their core military markets with civil applications. For more than ten years they have lobbied the European Com­mission, EU agencies, European regulators and national governments to support their industry, fund their research and development and create a regulatory environment in which ‘civilian’ drones can be sold and used. This effort has been hugely successful. What emerges is almost unequivocal support for the development of the technological and regulatory infrastructure required for the large scale deployment of drones within the EU. What is much less clear from the hotchpotch of EU projects and initiatives is what drones will actually be used for, and the extent to which the public will accept or appreciate such use. As noted above, no-one is disputing the obvious applications for which drones are likely to significantly reduce the cost of using manned aircraft (such as wide area or continuous surveillance) or provide help in crisis situations too dangerous for humans (the Fukushima meltdown for example). But in many of the scenarios developed for the EU, drones look more like a solution looking for a problem than vice versa. “You’re quite right”, one drone manufacturer acknowled­ged to Statewatch at a drone conference, “we don’t actually know what the problem is; we just know that the solution is UAVs”. This mentality has encouraged the development of scenarios in which extremely rare events in Europe (ter­rorist atrocities, nuclear meltdown, high-speed car chases etc.) are used to justify both substantial public expenditure and the acquisition and use of drones by domestic police forces. 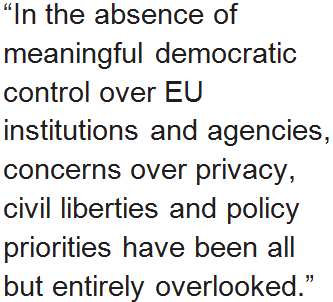 Yet, in the absence of meaningful democratic control over EU institutions and agencies, concerns over privacy, civil liberties and policy priorities have been all but entirely overlooked. EU drone policy is being fashioned through entirely technocratic processes that remain largely invisible to the parliaments and peoples of Europe. 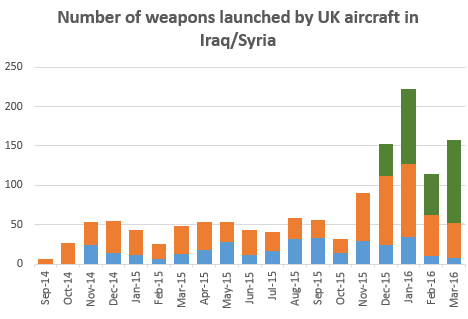 It is already abundantly clear that just as combat drones have reduced the threshold for con­ducting military strikes against foreign targets (would the USA even be fighting its “dirty wars” in Somalia, Yemen, Pakistan and Afghanistan without drones? ), surveillance drones will lower the threshold for launching overt and co­vert surveillance operations. But instead of exploring and addressing public attitudes around such obvious concerns, the EU is more preoccupied with “public acceptance”, and sees this as something to be manufactured rather than can­vassed. Reblogged this on Unterwachung – Sousveillance.